Apple has revamped its MacBook Pro Touch Bar range, delivering a laptop that's more powerful than the 2017 version, albeit with the same external design. Not changing the design this time out isn't significant as competitors – like Dell with its competing and excellent XPS 13 – are also choosing to stick with trusted designs. MacBook Pro 2018 vs MacBook Pro 2017: What's the difference? 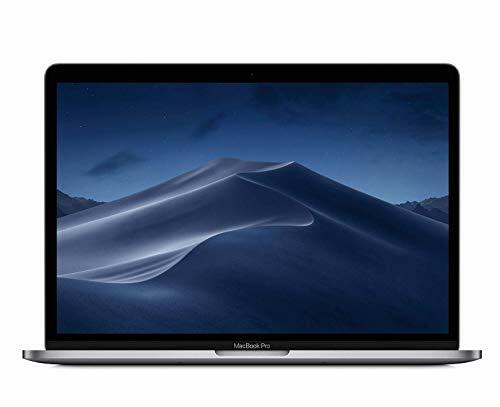 The 2018 MacBook Pro modifications are definitely worth having when you consider that pricing is set at the same level as the 2017 versions. So what do you get extra? Well, there's a new keyboard, plus a T2 security chip that encrypts the data on your SSD among other tasks (as first seen inside the awesome iMac Pro). The biggest upgrades really come in the internals, as both MacBook Pro sizes – the 13-inch on review here, but also the 15-inch – come equipped with Coffee Lake 8th-gen Intel Core i processors. Does this power boost make the 2018 MacBook worth its not inconsiderable asking price? The chassis of the MacBook Pro is unchanged from 2017. Available in grey or the traditional silver, the latest generation design consists of a 14.9mm thick chassis that dispenses with all traditional ports – save for the 3.5mm headphone jack and USB-C for connectivity and power. So there is no USB-A, SD card slot, DisplayPort, MagSafe power adapter. That sees the MacBook Pro following in the footsteps of the 2015 MacBook, which also did away with its conventional ports in favour of a single USB-C port (we've long wished it had at least one more). The 13-incher weighs 1.3kg – so it's certainly not in the category of super-light, like a recent 2-in-1, but you really don't notice carrying it around in a bag that much. And yes, it's USB-C that rules the roost here. All the Touch Bar Macs have four USB-C ports, which is at least an acceptable amount. The 13-inch models without the Touch Bar only have two ports – and by the time you're using one for power, just one additional port is not really enough at this 'Pro' end of the market. Naturally, you have to end up relying on dongles – usually some kind of USB hub – for connecting your various devices. The lack of standard USB connections only becomes a problem when you need to connect something – which for the most part, so goes Apple's reasoning, is that you won't. But if you're used to plugging in no end of different devices to your laptop then you'll need to invest in a bevy of dongles to solve your connection problems. While you can buy these from Apple at great expense, they are available from various third-parties too. We remember when Apple went to USB with the iMac and when it removed the optical drive: we whinged, but we adapted, as did everyone else. It may seem like an issue, but the ThunderBolt/USB-C issue is actually future-proofing. From our point of view the main problem has been using SD cards; so we've got a Transcend USB-C card reader that also has an old-style USB-A port for good measure. The trackpad in the 2018 MacBook Pro is the familiar Force Touch unit, while as we mentioned the keyboard is new. It is quite a bit less clicky than the 2017 version – which will be a relief for train travellers. The older model had problems including keys not responding, which has led to a recall for some older models. We have two 2017 models on the Pocket-lint team – one has had its keyboard replaced and the other has had several keys re-seated. While the display remains a 13.3-inch scale as before, it's now a True Tone display. This essentially means it will adjust the display depending on your ambient lighting conditions. Unlike True Tone on the iPhone X – which we've found to be patchy – we find the MacBook Pro's screen looks great in everything but very bright sunlight. As we mentioned Apple hasn't upgraded much externally but internally it's a very different story. The performance improvements across the board. The model on review here housed the 2.7Ghz Intel Core i7-8559U (quad-core) with 16GB 2133Mhz LPDDR3 RAM and Intel Iris Plus 655 Graphics. This Core i7 is an optional upgrade over the default Core i5-8259U and takes the price from £1,749 to £2,019. Add in the 16GB memory and the cost is up to £2,199. And a 512GB SSD instead of 256GB and that totals £2,399; top it off with a 1TB instead and you're looking at £2,799 all in. Ouch. We ran a Geekbench benchmark just to see how much beefier this new Mac is. Sure, we'd certainly expected a bit of an uplift over the 2017 (Core i7-7567U) model, but the performance increase clocked was an incredible 83 percent rise in overall multi-core performance. Staggering. The SSD speed is also pretty incredible, at over 2GB/s: unzip a 1TB file and it's a blink-and-you'd-miss-it job. In our real-world battery tests, we got around eight practical hours out of our review model using predominantly Photoshop, Chrome and Microsoft Office. That's not as good in our experience as either the Dell XPS 13 or Huawei MateBook X models we've reviewed. The XPS is best of the trio for battery life. But the MacBook is in and around what we'd expect. If you need more power for your work then the larger model may make more sense. The 13-inch doesn't have discrete graphics options, which we do feel is a shame, but the 15-inch has more space to handle the heat from the Radeon Pro 560X. Aside from graphics, the 15-inch model is a step-up in power since six-core Intel Core i7 and i9 processors are offered. Whether you need that kind of power is very much dependent on your needs. The 15-inch model can also be specced up to 32GB DDR4 RAM (the 13-inch is 16GB RAM), while the SSD can hit 4TB too (2TB max on the 13-inch). But all this comes at extra expense – and it can become quite considerable! Still controversial, the Touch Bar is a configurable OLED screen strip that replaced the space where the F-keys are on a conventional keyboard. The display is totally context-sensitive, so it changes depending on what app you're using. And it's beautifully crisp and clean even in daylight conditions. For some apps, like Microsoft Word, it can provide you with easy shortcut access to key functions. In Apple's Photos app you can also use it to scroll through images, which is very useful. And in iTunes you can forward through a track, for example. The Touch Bar's main issue is that you might simply not use it. Having a hand on the trackpad and keyboard feels like the norm. Looking down and having to move your hand to the top of the keyboard is not. It's tempting to suggest that it's superfluous and that Apple should just embrace touchscreen controls in MacOS... but that's a debate for another day. While the Touch Bar is very configurable via System Preferences, for simple functions like changing the system volume we find it less useful than having real, physical keys. Apple Touch Bar: What can I do with it and what apps are supported? However, one aspect of the Touch bar is ideal: the integrated TouchID fingerprint sensor. It seems a bit odd using TouchID now that it's not used on Apple's top-end iPhones, but it's so useful for unlocking this Mac. However, if you use an Apple Watch you'll know that you can auto-unlock your Mac with it, too. The MacBook Pro has so much going for it. With this laptop your bag, you feel you can do anything that's required. The lack of full-size USB ports feels less relevant now as all laptops are moving that way, although it's still a pain needing to remember dongles to use legacy devices. The Touch Bar still feels like a luxury, though, and if you aren't that concerned about having the very best performance then do look at the model without it. The performance increase on offer for the 2018 model is nothing short of excellent, too, although it won't be enough alone to upgrade from last year's model. But as a brand new purchase for someone needing a new laptop, the MacBook Pro delivers on its pro promise in style. If you think the Touch Bar is an unnecessary extra then the entry-level 13-inch MacBook Pro might be the perfect alternative. It can't be specced-out to as high-end a degree at the Touch Bar models, but for a cut of the price this super-slim Mac might be the perfect choice (if you can cope without the full-size USB ports anyway). One of our favourite laptops of the moment, the MateBook X Pro also has a fingerprint-based power button, a stunning thin-bezel around the screen, plenty of power and ample ports including full-size USB. We said it was the "Windows laptop to outdo the Apple MacBook Pro". The Dell XPS 13 is probably our favourite ultraportable ever. Now even thinner, it's a superbly-built device and has a power button fingerprint reader, too. If you don't need a 2-in-1 or a Mac, it's hard to better (although the below-screen webcam is silly). The XPS 15 is also worth a look, too.